Nissan’s U.S. sales have significantly outperformed the industry in 2014, up 12.7 percent CYTD through June. Sales have been led by the recently redesigned Altima, Rogue and Sentra – along with other models such as LEAF (+29.4%), JUKE (+44.9%), Frontier (+22.6%) and NV200 (+439.3%), which have shown strong results month after month. This gives the Nissan lineup great momentum heading into the 2015 model year. Headlining the changes for 2015 is the upcoming launch of the all-new Nissan Murano (due in late 2014). As the halo vehicle for Nissan’s expanding range of bold crossovers and SUVs, the dramatic 2015 Murano features a new V-motion front end, LED boomerang lights and a unique “floating” roof. Murano’s breakthrough exterior design carries into the interior, which offers an engaging social lounge feel through features such as advanced NASA-inspired Zero Gravity front and outboard rear seating and oversized Power Panoramic Moonroof. Many 2015 Nissan vehicles also receive an updated NissanConnectSM with Navigation and Mobile Apps system, including a 7.0-inch touch-screen color display, Nissan Voice Recognition for audio and navigation, SiriusXM Traffic and SiriusXM Travel Link® (SiriusXM subscription required, sold separately) and Hands-free Text Messaging Assistant. Following is a top-line overview of the 2015 changes, followed by more complete “Fast Facts” product information. As always, stay tuned to NissanNews.com for the latest updates on Nissan products, pricing and other activities in the United States and around the world. Now in the third model year of the fifth-generation design, Nissan Altima continues as one of the nation’s top-selling vehicles – embraced by owners for its premium exterior and interior designs, rewarding driving experience and innovative, driver-focused technology. Altima also offers efficient 38 miles-per-gallon highway fuel economy (2.5-liter engine) and an array of seven high-value available models that meet a range of customer needs and budgets. Now in its fifth year of production, the 2015 Nissan LEAF continues to surprise first-time buyers with its ease of ownership – offering the space and range to meet most drivers’ everyday needs, while also providing an exceptional value proposition due to zero spending on gas, lower maintenance costs and Federal and State tax incentives. Already the best-selling 100-percent electric vehicle in the world, Nissan LEAF’s popularity and sales continue to soar as more and more people discover its quiet and fun driving experience. The 2014 Maxima sedan will see an extended model year and continue to be available into 2015. The seventh-generation Nissan Sentra, introduced in fall 2012, continues to be refined for the 2015 model year with a number of interior comfort and convenience enhancements, including standard USB connection port and Bluetooth® Hands-free Phone System on all models. In addition, leather-appointed seats and heated front seats are standard on Sentra SL, and rear disc brakes are now standard on Sentra SR and SL grades. The Nissan Versa, the best-selling entry vehicle for four years running (calendar years 2010 through 2013)* in the highly competitive entry-level segment, offers high value, exceptional roominess and mid-size vehicle technology without a mid-size price. Following the introduction of an all-new Versa Note hatchback for the 2014 model year, the Versa Sedan receives an extensive makeover for 2015 – including new front and rear fascias, a range of interior refinements and new packaging content. Most prominent of the changes to the 2015 Versa Sedan is the bold new front-end treatment anchored by larger headlights, a more substantial looking fascia and standard chrome plating on the grille – all of which bring the vehicle closer in look to the Nissan Sentra, Altima and Maxima sedans. *According to IHS Automotive, Polk U.S. New Vehicle Registrations-non-luxury traditional sub compact segment, CY2009-CY2013. Following a highly successful debut as a 2014 model, the Nissan Versa Note enters its second year of production with a number of significant enhancements – led by the addition of new Versa Note SR and Versa Note SL trim levels. There are now a total of five models: S, S Plus, SV, SR and SL. The new 2015 Versa Note SR offers a number of unique exterior and interior treatments, including sporty front and rear fascias and grille, dark headlight surrounds, fog lights, rear spoiler, suede-like seats and 16-inch sport machine-finished aluminum-alloy wheels and outside rearview mirrors with integrated turn signals. The 2015 Versa Note SL features a range of special equipment, including NissanConnectSM with Mobile Apps, 5.0-inch color display, RearView Monitor, heated front seats, Divide-N-Hide® Adjustable Floor and 16-inch aluminum-alloy wheels. The big news for the 2015 is the addition of the Nissan GT-R NISMO, the fastest Nissan GT-R ever built and holder of the volume production car lap record (7:08.679) at the famed Nürburgring racetrack in Germany. The new Nissan GT-R NISMO features an advanced 3.8-liter twin turbo V6 engine rated at 600 horsepower and 481 lb-ft of torque* – increases of 55 horsepower and 18 lb-ft of torque versus standard 2015 GT-R models – along with enhanced aerodynamics, body reinforcement and ultra-precise handling thanks to a variety of suspension refinements. Drawing on decades of racing experience gathered by NISMO, the brand’s motorsport specialists, the race-oriented 2015 Nissan GT-R NISMO delivers “factory tuned” supercar dynamics with revolutionary enhanced aerodynamics and ultra-precise handling. Available in limited numbers, the GT-R NISMO features exclusive styling that embraces the longstanding racing philosophy of form following function. It has numerous motorsports-inspired technologies to enhance the car’s performance through optimized aerodynamics, suspension and powertrain, creating a well-balanced machine that is at home on both the road and track**. The GT-R NISMO joins the current 2015 GT-R models that are already on sale: GT-R Premium and GT-R Black Edition. These models all receive a range of important enhancements for the new model year – giving GT-R a more refined look and feel, without sacrificing one bit of its legendary performance. The 2015 Nissan 370Z continues to offer extraordinary performance design and an unmatched heritage as one of the most iconic sports cars in automotive history. Two new trim levels are offered for 2015: Sport and Sport Tech. In addition, significant changes have been made to the top-of-the-line 370Z NISMO (see below), including the first-ever available automatic transmission (in addition to the 6-speed manual). The most striking change for the 2015 370Z NISMO is its revised exterior design. Its GT-R-inspired functional and fully integrated aerodynamic body pieces have been redesigned to provide an aggressive and more aerodynamic new appearance – as well as optimizing front and rear downforce. Key changes include a new, deep front fascia with Hyper LED Daytime Running Lights, black headlight bezels, NISMO emblem and signature NISMO red stripe accents. The unique NISMO rear spoiler has been reshaped and downsized. The standard 19-inch NISMO super-lightweight forged aluminum-alloy wheels by RAYS also have been restyled for 2015 with a twin-five spoke design and a charcoal gray machine-finish (formerly silver). Inside, the unique NISMO-styled interior is enhanced with redesigned black-and-red Recaro® leather-appointed seats with Alcantara® accents. The new seats, co-developed with Recaro®, are exclusively designed for the 370Z NISMO to provide more uniform body pressure and better all-direction holding during spirited acceleration, braking and cornering. The interior also features red seat trim and stitching with NISMO logo, an Alcantara®-appointed leather-wrapped steering wheel and NISMO red tachometer. The 2015 370Z Roadster continues to offer unique design, performance and value – with the added exhilarating sensory experience of an advanced fully automatic convertible design. A new 370Z Touring Sport Roadster trim level is added for 2015. The stylish and roomy Nissan Armada again combines unbridled power, premium interior comfort and a wide range of available technology, making it a standout in the full-size SUV segment. Global introduced at the Geneva Motor Show in 2014, the 2015 JUKE gets even bolder, with new styling and available features. More information will be available on 2015 JUKE closer to its on-sale date in late 2014. The Nissan Murano has always stood out from ordinary crossovers with its refined yet daring and futuristic design. With the introduction of the new third-generation design, Murano kicks it up many notches with its concept car-like styling, premium interior and advanced, purposeful technology. The magnetic exterior design projects a sense of refined intensity, creating an immediate “wow” response. As the halo vehicle for Nissan’s expanding range of bold crossovers and SUVs, the latest Murano also expresses a new Nissan design direction – including its V-motion front end, LED boomerang lights and the unique “floating” roof appearance. The breakthrough exterior design carries into the interior, which offers an engaging social lounge feel through features such as the refined instrument panel, wide center console, advanced NASA-inspired Zero Gravity front and outboard rear seating, and the airy atmosphere created by the large windows and available oversized Power Panoramic Moonroof. Available technology features include NissanConnectSM with Navigation and Mobile Apps, 8-inch color display with multi-touch control, Around View® Monitor, 8-way power driver’s seat with power lumbar support, SiriusXM Satellite Radio (SiriusXM® subscription required, sold separately), Nissan Intelligent Key® with Push Button Ignition, iPod® interface, 11-speaker Bose® premium audio system (including dual subwoofers), Remote Engine Start with Intelligent Climate Control (from key fob), Bluetooth® Hands-free Phone System and Streaming audio via Bluetooth®. Available safety and security systems include Moving Object Detection (MOD), Blind Spot Warning (BSW), Predictive Forward Collision Warning (PFCW) and Forward Emergency Braking (FEB). The new Rear Cross Traffic Alert (RCTA) system utilizes radar to detect a moving vehicle behind the Murano approaching from either side of the parking space. The 2015 Murano is set for a late-2014 arrival at Nissan dealers nationwide. Totally redesigned just two years ago, the 2015 Pathfinder offers exceptional levels of versatility, fuel efficiency and full-size comfort for seven passengers. Pathfinder is available in 2-wheel drive and 4-wheel drive configurations, powered by a 260-horsepower 3.5-liter DOHC V6. The attractive interior design includes comfortable seating for seven, along with Pathfinder’s innovative EZ Flex Seating System™ with LATCH AND GLIDE™, an industry first 2nd row tip-up seat, allows easy 3rd row access with a child safety seat still installed. A range of available features is also offered, including Around View® Monitor and 13-speaker Bose® Premium Audio system. The boldly styled Nissan Quest again offers a range of family friendly features, including one-touch power sliding doors, quick release fold-flat 2nd and 3rd row seats, Advanced Climate Control System, and an always-available rear storage well. The Nissan Rogue, which was completely redesigned for the 2014 model year, challenges convention once again with bold emotive styling, a premium interior created with comfort and multi-tasking in mind, and an array of available affordable technologies. Rogue offers optional 3-row/7-passenger seating, along with exceptional passenger and cargo flexibility with its innovative EZ Flex™ seating System and innovative Divide-N-Hide™ Cargo System. Every 2015 Nissan Rogue is equipped with a responsive 2.5-liter 4-cylinder engine rated at 170 horsepower and 175 lb-ft of torque. The engine is matched with an advanced Xtronic transmission. Rogue comes in three well-equipped models, S, SV and SL, each in a choice of front-wheel or all-wheel drive. With the popular Nissan Rogue totally redesigned for 2014 with more features and amenities, Nissan continues to offer a simplified lineup of the previous generation Rogue under the Rogue Select nameplate. Designed to appeal to more price-sensitive buyers, it is available in just one trim level – Rogue Select S – in a choice of front-wheel drive or all-wheel drive. Every 2015 Rogue Select features a standard 170-horsepower 2.5-liter 4-cylinder engine, Xtronic transmission, Vehicle Dynamic Control (VDC) and 4-wheel disc brakes with Anti-lock Braking System (ABS). The adventure-ready 2015 Nissan Xterra combines power, utility, value and authenticity – inspiring and facilitating outdoor enthusiasts to “attack life” wherever they go. Nissan Frontier continues to be a leader in the mid-size truck segment, combining premium hardware, extraordinary power and an exceptional level of on- and off-road performance. The powerful full-size 2015 Nissan Titan continues to offer a unique combination of style, innovation and excellent value – including a range of body, bed and drivetrain configurations designed to fit a variety of buyer needs from a durable business tool to a versatile family adventurer. For 2015, Titan is again offered in King Cab and Crew Cab body styles with a choice of 4×4 and 4×2 drive configurations and two bed lengths. Titan is available in four well-equipped models – S, SV, PRO-4X and SL. Titan is built on Nissan’s rugged F-Alpha pickup platform, featuring a powerful 5.6-liter DOHC Endurance V8 rated at 317 horsepower and 385 lb-ft of torque. Titan offers a standard 5-speed automatic transmission and a maximum towing capacity of up to 9,500 pounds for King Cab and 9,400 pounds for Crew Cab (when properly equipped). Nissan Commercial Vehicles started business in the United States in spring 2011 after operating in Japan and globally since 1935. 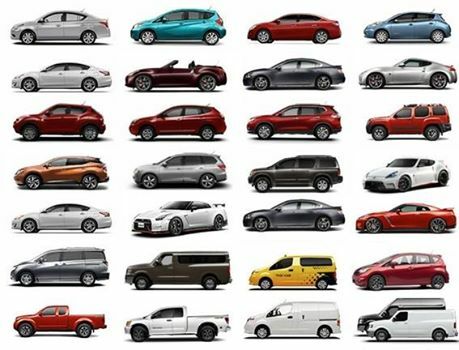 The lineup now includes the NV Cargo, the NV Passenger, NV200 Compact Cargo and NV200 Taxi. Once again in 2015, the Nissan NV Cargo van again provides exceptional utility – thanks to a long, wide cargo floor, square-top wheelwell housings and nearly vertical sidewalls. Along with maximizing cargo space, the sidewalls accommodate aftermarket storage systems without excessive modification. The popular NV200 Compact Cargo van provides large cargo capacity with a small exterior footprint. It offers an efficient 2.0-liter 16-valve 4-cylinder engine, a new, next-gen Xtronic transmission and a roomy cargo area, which allows for loading standard U.S. 40×48-inch pallets. The Nissan NV200 Taxi is the product of a unique development collaboration. It reflects the input of hundreds of taxi owners and drivers, and thousands of passengers from all walks of life. Key features include ample room for four passengers and their luggage, sliding doors with entry step and grab handles, transparent roof panel, independently controlled rear air conditioning, a mobile charging station for passengers (including a 12-volt electrical outlet and two USB ports), antimicrobial and easy-to-clean seat fabric and flat “no hump” passenger floor area for a more comfortable ride. The NV200 Taxi comes with Nissan’s proven 2.0L 4-cylinder powertrain, engineered to enhance the emission performance and fuel efficiency of the taxi fleet. Standard safety equipment includes roof-mounted curtain supplemental air bags and driver and front-passenger seat-mounted side-impact supplemental air bags. Summary The established leader in the “no gas, no tailpipe” zero-emission era, the fully electric LEAF is assembled in Smyrna, Tenn., including battery production. Summary The 2014 model year Nissan Maxima will continue to be available into 2015. The flagship sedan offers breakthrough sports sedan styling, a driver-oriented cockpit, ample comfort and luxury and an advanced drivetrain anchored by Nissan’s legendary VQ-series V6 engine. Summary The 2015 Sentra once again offers a class-above look and feel inside and out, along with engineering efficiency that results in outstanding highway fuel economy. Sentra also features exceptional rear seat legroom (37.4 inches) and ample trunk capacity. Enhancements include revised standard content for SV, SR and SL grades, standard rear disc brakes on SR and SL and standard Bluetooth® Hands-free Phone System on all models. Summary Versa Note offers an energetic exterior design and ample total interior volume, front headroom, rear legroom and cargo volume (with rear seats up). Class-exclusive* technology includes an available Around View® Monitor, Active Grille Shutter and Tire Pressure Monitoring System with Easy Fill Tire Alert. Two new grade levels are added for 2015: Versa Note SR and Versa Note SL. Other enhancements include revised features and standard equipment, along with revised package content and new SR Convenience Package. *AutoPacific segmentation. MY15 Versa Note v. 2014 Economy Compact Class, 5 passenger vehicles, excluding electrics and hybrids. Summary The GT-R is the purest, most passionate expression of the Nissan brand. Already one of the most legendary street supercars in automotive history, the Nissan GT-R adds a new GT-R NISMO to the existing lineup of Premium and Black Edition models. Availability is limited in the United States for GT-R NISMO. Summary The 2015 370Z NISMO offers a dramatic new exterior design and refined NISMO-exclusive interior accents, including redesigned black-and-red Recaro® leather-appointed seats with Alcantara® accents. As in previous years, it stands apart from non-NISMO 370Z Coupe models with 350 horsepower, a specially tuned suspension and unique super-lightweight forged alloy wheels. Summary Restyled for 2015, the bold Nissan JUKE continues to offer acclaimed levels of performance. More information will be available on 2015 JUKE closer to its on-sale date in late 2014. Summary Third generation of Nissan’s popular flagship crossover symbolizes Nissan’s design-led product and brand renaissance. Murano’s styling delivers the refined intensity exterior and social lounge interior first introduced on the bold Resonance Concept. It carries forward new Nissan design direction with V-Motion front end, boomerang lights, floating roof treatment and efficient aerodynamics. The 2015 Murano is set to go on sale in late 2014. Summary The 2015 Pathfinder once again combines family adventure capability with seating for seven, intuitive 4WD and 5000-pound standard towing capacity (when properly equipped) – along with an unprecedented level of premium style, comfort and thoughtful technology. Summary The Nissan Rogue was completely redesigned for the 2014 model year and has been extremely well received by consumer and media alike. It challenges convention once again with bold emotive styling, a premium interior created with comfort and multi-tasking in mind, and an array of available affordable technologies. Rogue offers optional 3-row/7-passenger seating, along with exceptional passenger and cargo flexibility with its innovative EZ Flex™ seating System and innovative Divide-N-Hide™ Cargo System. Every 2015 Nissan Rogue is equipped with a responsive 2.5-liter 4-cylinder engine rated at 170 horsepower and 175 lb-ft of torque. Rogue comes in three well-equipped models, S, SV and SL, each in a choice of front-wheel or all-wheel drive. Summary The Nissan Rogue Select is designed to offer a fusion of value, versatility and agility. It is available in one trim level, Rogue Select S, in a choice of front-wheel drive or all-wheel drive. Every 2015 Rogue Select features a standard 170-horsepower 2.5-liter 4-cylinder engine, Xtronic transmission, Vehicle Dynamic Control (VDC) and 4-wheel disc brakes with Anti-lock Braking System (ABS). Summary The powerful full-size Nissan Titan has established an outstanding reputation as a rugged, reliable choice for active truck buyers seeking style, innovation and excellent value. It offers a range of body and drivetrain configurations to fit a variety of buyer needs and uses – from durable business tool to versatile family adventurer. Summary Offered for both personal and commercial use, the 4-row/12-passenger Nissan NV Passenger features the most flexible seating configurations in the full-size passenger van segment, along with roof-mounted curtain supplemental air bags for side-impact and rollover head protection for all outboard passengers and standard head restraints and integrated seat belts for all rear seating positions. Summary The NV200 Taxi is the product of a unique development collaboration – reflecting the input of hundreds of taxi owners and drivers, and thousands of passengers from all walks of life. Designed “from the inside out” with ample room for four passengers and luggage, the NV200 Taxi offers easy entry/exit sliding doors, a panoramic transparent roof panel, anti-microbial seating surfaces and independently controlled rear air conditioning. In North America, Nissan’s operations include automotive styling, engineering, consumer and corporate financing, sales and marketing, distribution and manufacturing. Nissan is dedicated to improving the environment under the Nissan Green Program and has been recognized as an ENERGY STAR® Partner of the Year in 2010, 2011, 2012, 2013 and 2014 by the U.S Environmental Protection Agency. More information on Nissan in North America and the complete line of Nissan and Infiniti vehicles can be found online at www.NissanUSA.comand www.InfinitiUSA.com, or visit the Americas media sites NissanNews.com andInfinitiNews.com.